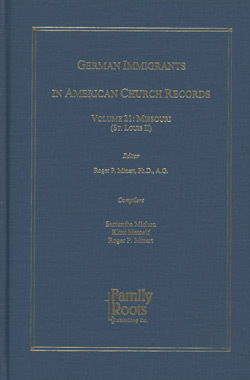 German Immigrants in American Church Records - Vol. 21: Missouri (St. Louis II); Edited by Roger P. Minert; Ph.D., A.G.; 2017; 612 pp; Hard Cover; Every-name index; Acid Free Paper; ISBN 978-1-62859-175-0; Item #FR0655. Richard Henry Stickfort b. Gehrde, Hannover 26 July 1859; d. St. Louis, MO 28 Nov 1932; bur. St. Louis 1 Dec 1932; m. Marie Dierkerr. He immigrated in 1875. Ref: p. 146. August Voigt b. Stettin, Pommern 8 July 1853; d. St. Louis, MO 23 Jan 1933; bur. St. Louis 25 Jan 1933; m. Annie Bohne. Ref: p. 147. David Adler b. Breslau, Schlesien 17 April 1868; d. St. Louis, MO 27 Jan 1933; bur. St. Louis 30 Jan 1933; m. Bertha Huster. Ref: p. 147. Fred Rohlfing b. Rahden, Westfalen 21 Jan 1864; d. St. Louis, MO 12 Feb 1933; bur. St. Louis 16 Feb 1933; m. Elizabeth Walter. Ref: p. 147. Carondelet German Evangelical Lutheran Church, St. Louis, St. Louis Co.
St. Peter’s Evangelical and Reformed Church, St. Louis, St. Louis Co. The following 5,016-surname index was compiled from the 14,958 entries found in German Immigrants in American Church Records, Vol. 21.